This Bangalore-based startup is founded by Manish Agrawal, a mechanical engineer, and Kartik Jain, a chemical engineer. Both Agrawal and Jain resigned from corporate jobs to start the venture. They own savings, along with help from a few angel investors, helped get things started. Now, it is being “incubated” by the Bangalore chapter of The Indus Entrepreneurs. Picsquare was selected from among 10 contestants in the TiE Entrepreneurship Acceleration Program that aims to foster businesses by a creating an ecosystem similar to the one in Silicon Valley. I got a chance to meet the founders in person in Bangalore. In this interview, they talk about how they got to found the company, their revenue models and their plans for the future. Webyantra also has a review of PicSquare service. If there is such a huge growth in mobile phones, how come there are so few mobile blogs around? How difficult or easy is mobile blogging and how does one become a mobile blogger? Jace a.k.a Kiran Jonnalagadda is one of India’s earliest mobile bloggers and his moblog is one of the most active ones around. Jace is an information architect, designing web applications and community spaces. He speaks with Kiruba about various issues related to mobile blogging, discussing some very useful tips for folks who are interested in getting started with this new medium. Hack Days seems to be the in-thing amongst developers. The 24-hour coding challenge has caught the fancy of the tech community which is looking for various ways to make work more interesting. Barely a few weeks after Yahoo conducted its much publicized public Hack Day, Sabre Labs is holding one for its employees here in India. Jay Fichialos flew in from the U.S. to India to help coordinate the hack day at Sabre’s Bangalore office. Jay Fichialos is a community and technology liaison for Sabre Labs, in Southlake, Texas, where he leads research on where online communities and travel intersect. Most recently he has been guiding the development of Bambora.com a social networking site for travelers, and promoting Hack Day innovation events at Sabre. Jay’s professional interests include information visualization, designing for experience, and social change through technology. He’s an avid supporter of the BarCamp movement, and has helped organize a number of the events. WiMax is the promised shangrila for bigger broadband penetration in India. It’s been a distant hope for many years and there’s been much hype surrounding it. Lately, we’ve been hearing about WiMax being deployed in a few cities in India, so it’s a good time to get a realistic take on the WiMax scenario. We speak with Sujai Karampuri, the founder and CEO of Sloka Telecom, a company that aims to be an important player in the WiMax market in India. 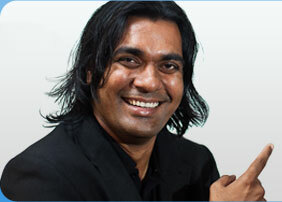 Sujai has 10 years of wireless experience in product development, system architecture and strategy formulation. He has worked with Alcatel in the U.S. and Europe for seven years, where he focused on GSM wireless networks. Later, as system architect for Nortel Networks Division at Sasken, Bangalore, he was involved in overall architecture of GERAN products. Sujai obtained his bachelors from REC, Warangal and got his masters from Michigan Tech, Houghton. It’s not often you come across a company where the CEO does not have a corner office but has the same setup as a trainee developer. I was pleasantly surprised that the ThoughtWorks office has an open and innovative culture — something that’s not too common in India. The fact that they played a good host to BarCampers over the weekend is a good testimony to that. The credit goes to Rohit Bansal, director of delivery at ThoughtWorks Technologies India Pvt. Ltd. Rohit is the subject of this interview, where he talks about what ThoughtWorks does and how it aims to be more than just another software arm of an international IT company. He joined ThoughtWorks in the U.S. in 1999 as a technology consultant. He spent most of his time working with mostly Silicon Valley startup companies in the Enterprise Application Integration (EAI) space. With the intention of promoting the Indian IT industry, he returned to India and set up ThoughtWorks’ Indian operations at Bangalore with an initial headcount of 10. He has played multiple roles in ThoughtWorks India, from MD – India Operations to director, Delivery. He has played an important role in helping ThoughtWorks India, grow to its current size and making it the most strategic entity within ThoughtWorks – the global organization. ThoughtWorks India now has grown to 180 people with a new facility in Pune this year. Apart from this, Rohit is passionately involved in various NGO activities.